Gaza militants fired five projectiles toward Israel on Saturday night, the Israel Defense Forces said, in apparent violation of a ceasefire agreed to by Hamas and Islamic Jihad earlier in the week. Four of the launches were intercepted by Israel's Iron Dome aerial defense system, while the fourth landed in Gaza, the Israeli military said. 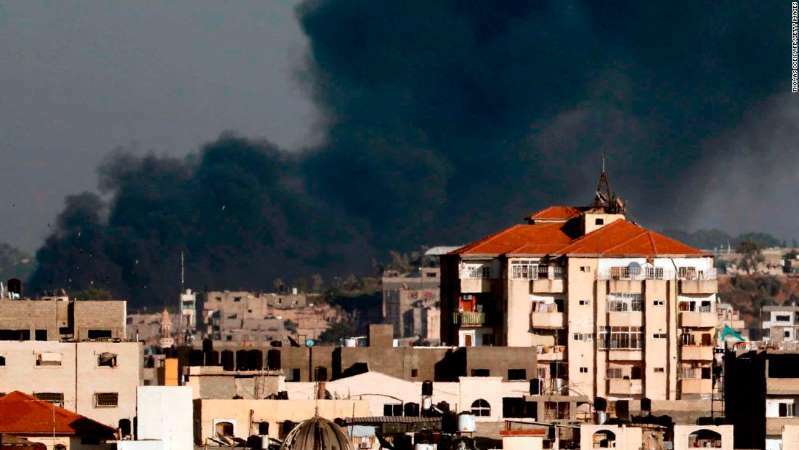 In response to the initial fire by militants -- which consisted of two rockets -- the Israeli air force launched strikes on 10 Hamas targets in Gaza. Among the targets were two munitions manufacturing and storage sites, the Israeli military said, as well as a military compound. The exchange of fire comes less than five days after the biggest flare-up in fighting since the end of the last war between Israel and Hamas, four years ago. Tuesday, the Israeli military said that about 100 rockets and mortars were fired from Gaza toward Israel. Israel responded with 60 airstrikes. Israel never acknowledged any ceasefire had been agreed to with militants after that round of fighting. Instead, Israeli military spokesman Jonathan Conricus told CNN that "quiet will most likely be met with quiet and terror will be met with a very strong response." Israeli soldiers Friday killed one Palestinian and injured at least a hundred others protesting in Gaza along the fence that separates the territory from Israel, according to the Palestinian Ministry of Health. The person killed was identified as medical nurse Razan Ashraf Al Najjar, 20, ministry officials said.